If you live on an estate and use communal recycling facilities, you should have got a leaflet through your door to tell you more about this. If you missed it – see below! Categories: community engagement, Environmental Campaigns, recycling | Tags: Communal recycling bins, estates recycling, Euro bins on estates, new bin lock trial, New bin locks trial, New estates bin locks, New locks on bins, new push locks on estates, New Taylor locks on bins, Recycling on Lewisham housing estates, slam locks, slam locks on estates recycling bins, Taylor, Taylor recycling bins | Permalink. 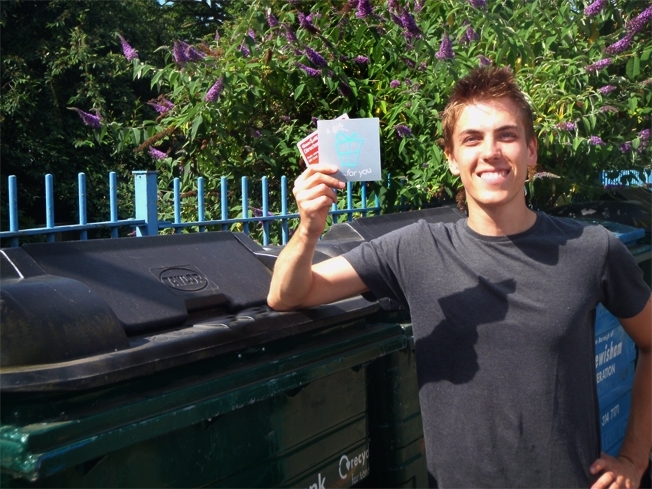 We recently ran a competition for those of you who recycle in communal bins. We wanted to make people aware of the new types of locks being fitted onto large recycling bins which we hope will help in the fight against non recyclables being put into recycling bins! The new locks will prevent the whole lid from being lifted up, so it’s impossible for a whole black sacks worth of rubbish finding its way in there. We know that lots of people who use the communal recycling bins work really hard to make sure the right things go in there, making it so frustrating when something non- recyclable gets put in. Nappies, black sacks, garden waste, wood all make the bin ‘contaminated’ often meaning all of the contents have to incinerated instead of being sent to be turned into something new. This also causes the bin to not be emptied on the right day while we arrange for a different vehicle to empty it – all costing time and money. To put recycling into a bin with one of the new locks, the letter box lid part should be lifted. 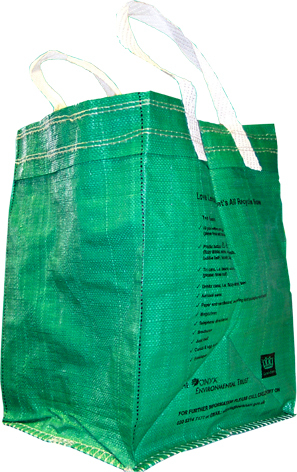 It is possible to get an untied carrier bag filled with recycling through or items can be placed in one at a time. Alex popped into the depot to collect his voucher. 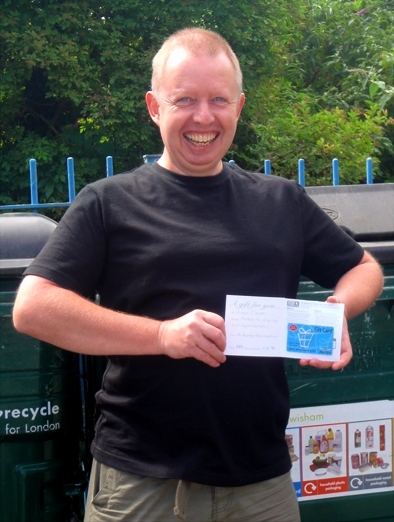 Leaflets were delivered to estate properties and on the back was a competition to win one of four £50 shopping vouchers. 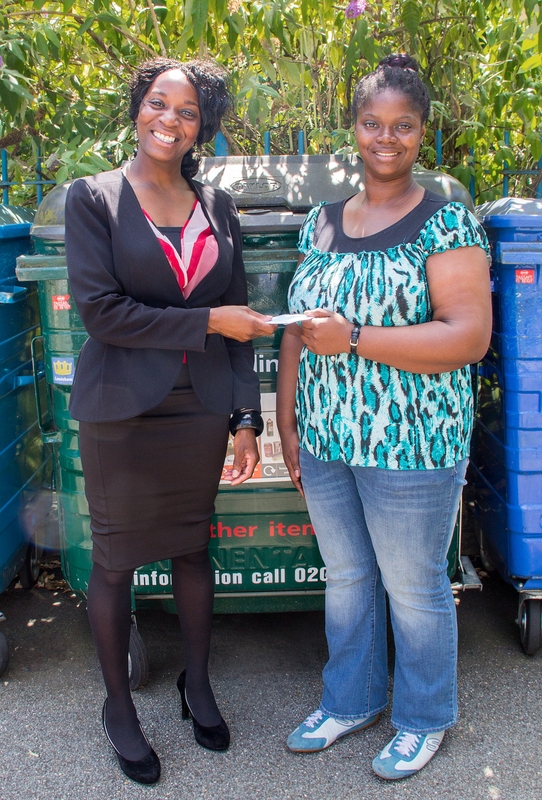 One of the lucky winners- Brockley resident, Fontella Alvaranga (first picture above) was presented with her prize by Cllr Rachel Onikosi- Cabinet Member for Public Realm & our new lead member for Environment Services. Other vouchers were won by biology student, guitar teacher and avid recycler, Alex Marshall (above), who was really pleased to take part in the competition and was chuffed to win one of the prizes. Richard J Watts was our third winner. Well done to all three winners and hope you enjoy spending the vouchers. Categories: community engagement, Environmental Campaigns, Uncategorized | Tags: Alex Marshall, Cabinet Member for Public Realm, Cllr Onikosi, estates bins, estates recycling, Fontella Alvaranga, Funding for recycling on estates, New estates bin locks, new locks on estate bins, New Taylor locks on bins, push to go, Push to go locks, Recycling on Lewisham housing estates, Recycling voucher winners, Richard J Watts, slam locks, Taylor | Permalink. How can I recycle if I live on an estate? Categories: community engagement, Environmental Campaigns | Tags: contamination issues, estates recycling, Green Recycling Estates Bags, large estates recycling bins, recycling infomercials, recycling on estates, Recycling on Lewisham housing estates, say no to contamination | Permalink. LWARB is an acronym for the London Waste and Recycling Board and an organisation that the London Borough of Lewisham applied to for some funding last year. 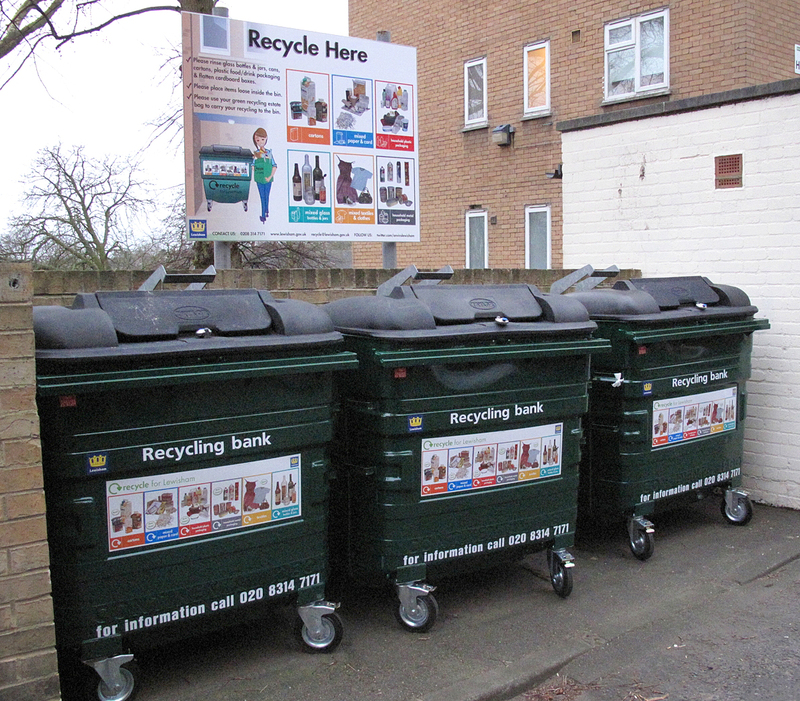 £33,300 was awarded to Lewisham Council to improve and update bins and signage on estates and flatted properties. It was also used to provide reusable bags for residents to help them carry their recyclables from their homes to the recycling sites on the estates and to fund teams of door knockers. This was also an opportunity for the Council to produce a brand new leaflet for all estates, new developments and blocks of flats to make residents aware of the new changes to the service. One of the five sites on the Sydenham Hill estate with brand new bins and signs. 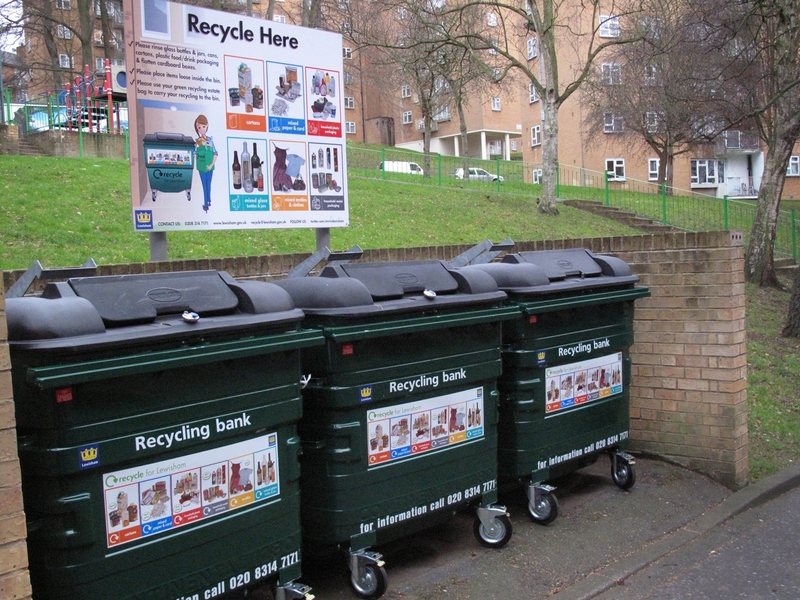 The funding aimed to tackle the levels of participation in recycling from estates residents and increase tonnages across all flats in the borough. The role of the door knocking teams was to speak to the residents living on estates and flatted properties to explain about the Council’s recycling service and how they can participate in it. 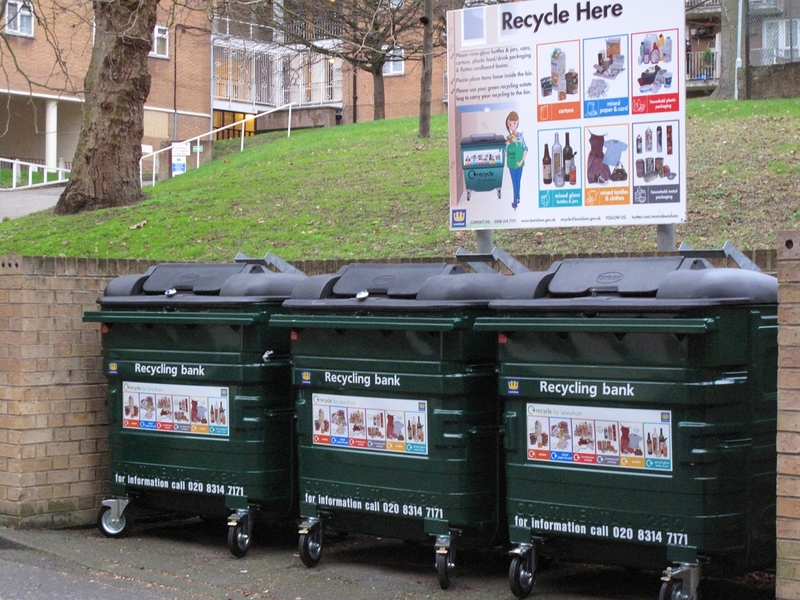 With the change of recycling contractor, this was seen as an opportunity to inform estates residents about the additional materials that can now go into the recycling bins, i.e. tetra-paks, textiles and mixed plastics. 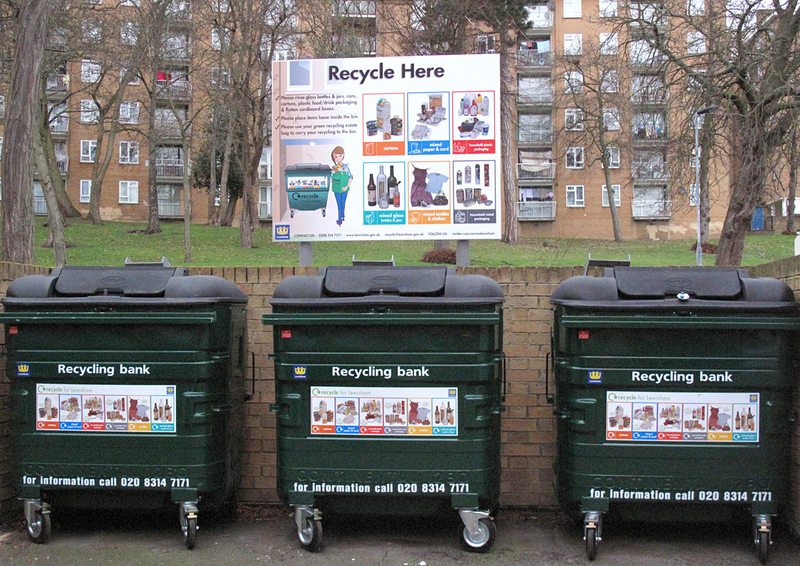 Contamination of communal recycling bins is also a major issue on estates and causes problems with collections. When a recycling bin is contaminated, a refuse vehicle is sent to empty the entire contents of the bin (where it is incinerated) rather than risking rejection of further tonnages when the recycling vehicles tip at the materials recycling facility (MRF). This is a second site on the Sydenham Hill estate that benefitted from having new bins and signs. This was therefore an opportunity for the door knocking teams to speak directly to the residents of the estates and flatted properties to prevent any further problems. Black sacks, food, garden and electronic waste are seen as contaminants which the door knocking teams were able to discuss directly with the residents. All the residents were also left with a leaflet which gave details about what can and can’t be recycled using the large green bins on the estates. Some estates also benefitted from new signage which again made it perfectly clear what the bins were to be used for. There are still reusable bags left for any residents that didn’t receive one during the door knocking last year. If you live on an estate, a block of flats or a private development and would like a reusable bag, please email recycleforlewisham.gov.uk and let us know your details. Categories: community engagement, Environmental Campaigns, Uncategorized | Tags: Door knocking on estates, estates bins, estates recycling, Funding for recycling on estates, GREB, Green Recycling Estates Bags, London Waste and Recycling Board, LWARB, New recycling bins on estates, new signage on estates, recycling funding, recycling on estates | Permalink.